Cook eggs in a large saucepan of boiling water 7 minutes. Drain and place in a large bowl of ice water; let cool. Prepare a grill for medium-high heat. Rub halibut with 2 Tbsp. oil; season with salt and pepper. Grill, skin side down, until skin is charred and fish is nearly cooked through, 5–8 minutes. Turn and grill just until cooked through, about 1 minute. Transfer halibut to a plate and remove skin. Toss vegetables with remaining ¼ cup oil in a large bowl; season with salt and pepper. Grill, turning occasionally, until lightly charred and tender. Time will be different for each vegetable (about 2 minutes for scallions and garlic scapes, 4 minutes for Romano beans, 8–10 minutes for eggplants, 10–15 for potatoes). Transfer to a plate as they are done. Carefully peel and halve eggs (yolks will still be a bit loose in the center). 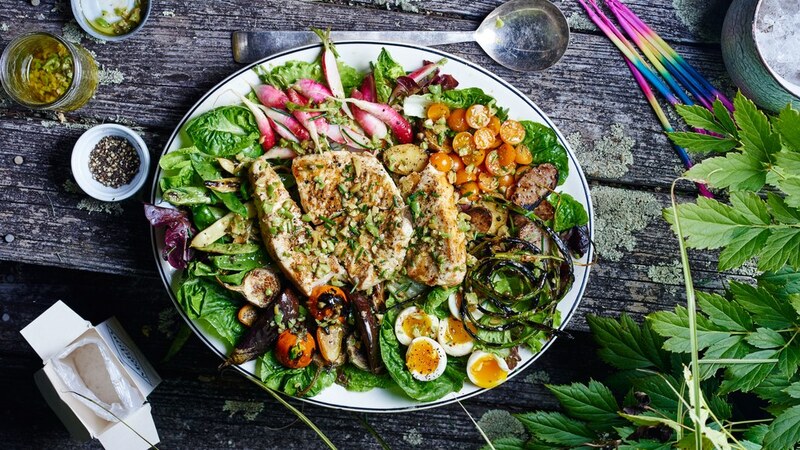 Arrange lettuce leaves on a platter and place halibut, grilled vegetables, tomatoes, radishes, and eggs in separate areas on top. Spoon some Green Olive Tapenade over; serve remaining tapenade alongside.